We have apps on our iPads that read us our friend’s tweets… now there is a free app called Qwiki that will read us things we might look up in the Dictionary. This isn’t a ‘news’ app, the app should be thought of as a Dictionary with over 3 Million entries in it. Coming from the NY Times, the data is very up-to-date. The reading is done through a nicer electronic women’s voice. Launching the app, you are given a group of areas that cycle through automatically. A few images for each group sweep by to be chosen with a tap. 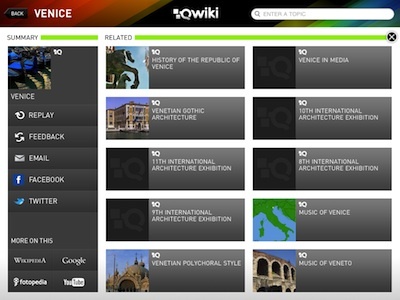 The built in default Qwiki groups are: Home, Daily, Popular, Actors, Cities, Natural Wonders and Monuments. It is possible to jump ahead by choosing one of the area titles from the upper bar. 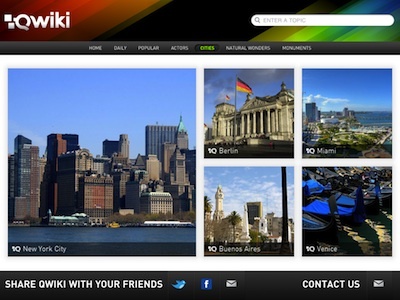 All of the data is coming from an online service so Internet access is required to use Qwiki. When you choose an image, a voice starts reading the text about that item to you, sliding images across the screen as it goes. For a few folks that just love information, this has been a app they have open all the time on the desk so they can hear and glance over when something of interest comes up. Images in the presentation are shown across the bottom allowing to jump forward/backward with a tap. A progress bar at the very bottom keeps you informed on how much more info is yet to be read. The ‘speaking cloud’ button on the right of Qwiki is used to toggle on/off the read along text mid page. Removing the text does not cause anything to resize to fill the area. Searching for your item of interest is done via the box in the upper right corner. We did find that Qwiki’s search wasn’t very ‘intelligent’. When we put Blue Bonnet in as two words, it didn’t show the flowers as an option… as one word worked fine. Which means, you need to know what your searching for. At anytime during the reading, you can tap the ‘+Q’ icon in the lower right corner, taking you to the break down of the information being read and pictures shown. As well, the options to share with friends via Twitter, Facebook and emai are available. 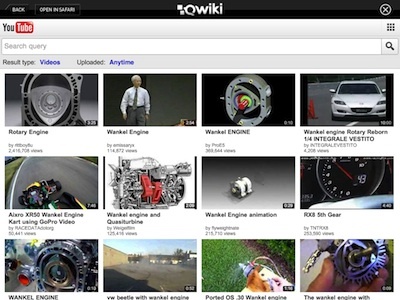 If you need more information than provided by Qwiki, there are four buttons in the lower left corner to take you to Wikipedia, Google, YouTube and Fotopedia – the resulting page is pre-populated with your requested word for faster access. 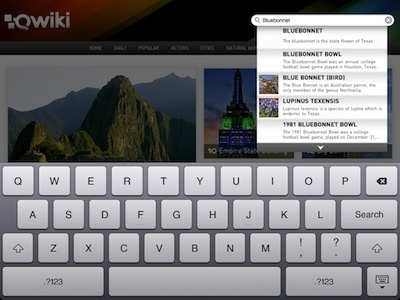 Pages, like Wikipedia, open within Qwiki with the option to move out to the built in Safari browser. Qwiki does not offer audio versions of the text on the pages outside of their service. The only issue we saw with the additional information is no quick way of getting back to the start. All pages have the upper left ‘back’ button and upper right ‘X’ close button. Tapping either will take you to the previous screen. Which means you have to go ‘back’ several screens if you dive very deep into a word and want Qwiki to give you a different one.